Another interesting point is higher frequency sounds tend to be louder.....which is what happens naturally in the big room. 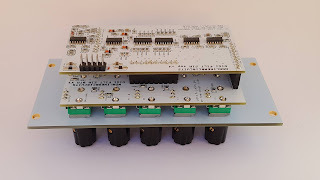 This module is made of 3 neuron circuits and a difference rectifier. The neuron outputs are fed to the switching pins of the next neuron’s attenuated input; 1>2, 2>3, 3>1. 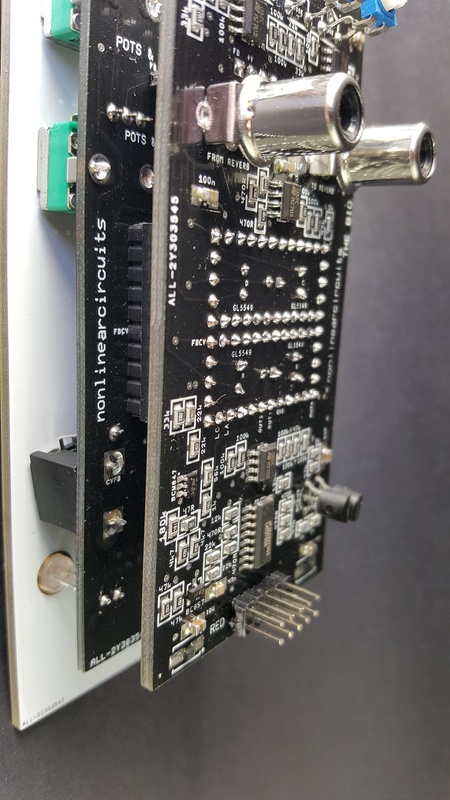 This means the circuit will work with a single input signal, delivering all kinds of mayhem at the outputs. There are also 4 shared inputs so that the same signals can be fed to neurons 1&2 and neurons 2&3. The Difference Rectifier compares the outputs of neurons 1&3 to the output of neuron 2. 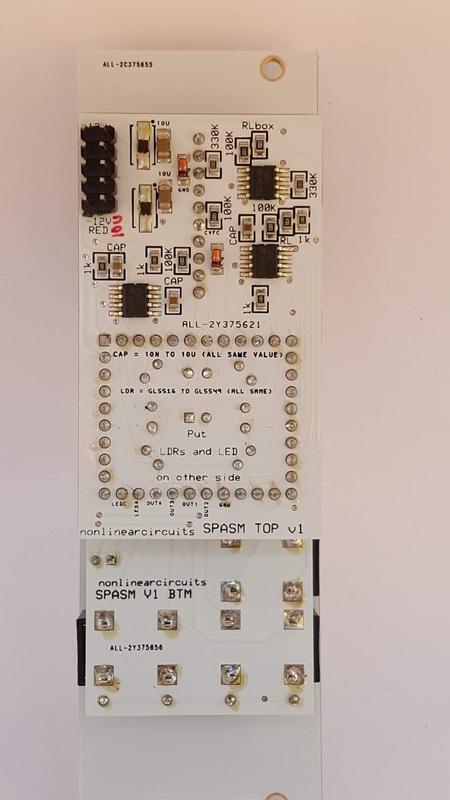 If you want to use the neurons individually then turn down the input pots or use the upper neuron specific inputs to disconnect the signals coming from its neighbour. 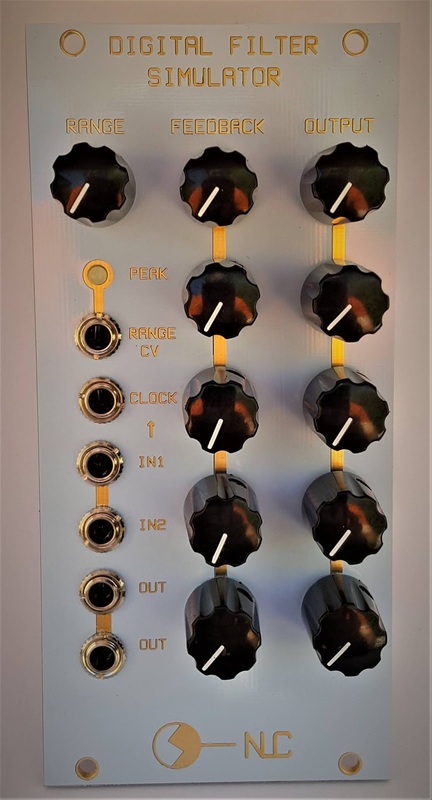 Just like a set of synaptically connected neurons, this module is noisy and unruly. It is never going to learn anything it lives in and for the moment. It can be used to process audio, CV or audio and CV……do whatever you like to it. The name is from the computer described in the 1964 Keith Laumer novel – The Great Time Machine Hoax, although this module differs in ability (can’t time travel or get married ….. afaik), the name is quite suitable. 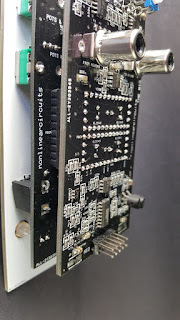 This module takes the classic Sprott jerk circuit and replaces all the resistors with LDRs.....a 7 way vactrol. This means the brightness of the LED in the giant vactrol controls the frequency of the circuit. 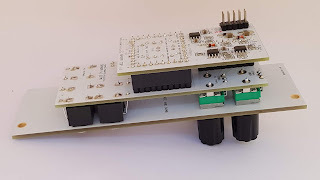 It is a very easy build and will give you a very flexible chaotic circuit. The CV inject jack allows you to control the chaos with gates and CV, some signals will cause it to pause or stall, others will make it glitch & freak out. CV freq controls the LED which, in turn, controls the resistance in the LDRs. It is a very flexible build; you can use any LDRs you like, so long as they are the same. You can also use any capacitors you like for CAP, so long as they are the same. Of course, the LDRs and capacitors you choose will affect the behaviour & frequency range of the circuit. GL5516 LDRs go to 500kΩ off resistance whereas GL5549 go to 10MΩ+ (anywhere from 10MΩ to 20MΩ), so will be a lot slower but will give a much wider frequency range and some very unpredictable outputs. 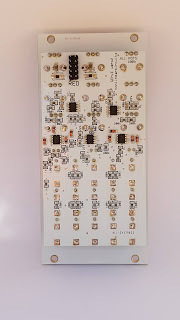 Similarly with capacitors 10uF will be a lot slower than 10nF. If going for the more extremely slow values, GL5549 LDRs and 10uF caps, the module will stall at minimum pot settings and generally needs a CV on the CV freq input to make it operate. This is actually a good thing as you can turn the signals on and off with CV or gates. This module is based on ideas presented in a 1969 IEEE paper titled - Hybrid Implementation for Sampled-data controllers. The paper presents the canonical form of a generalised digital filter made using analogue elements.....yes this is an analogue circuit; all CMOS and op amps. I played around with various versions for a few years and, as usual, settled on the simplest and cheapest version. 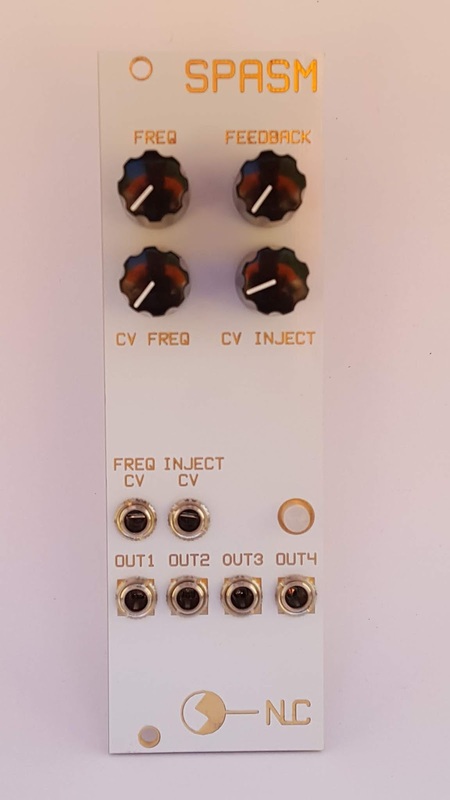 Incoming audio signals (or CV if you want to use it as a pattern generator) are fed to a 4 bit A/D stage, these 4 bits then go thru a 4 stage delay (shift registers). 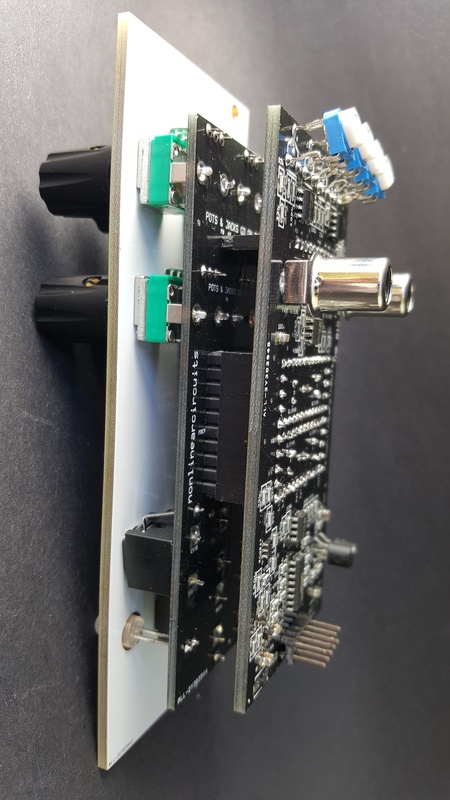 Each delayed bit is re-united with its siblings via four D/A stages and the stepped signals are then fed back to the input via an attenuator/inverter stage and are fed to the summed output, again via an attenuator/inverter stage. The circuit is controlled by the clock input that ticks over the shift registers. CV controlling the VCO that supplies the clock signal will in turn control the filter. The Range pot needs to be set to a suitable level, I like it when the peak LED is flickering. Range can also be controlled by CV which will allow you to shift from a 1 bit signal to a 4 bit or overdrive the crap out of it and lock everything up. 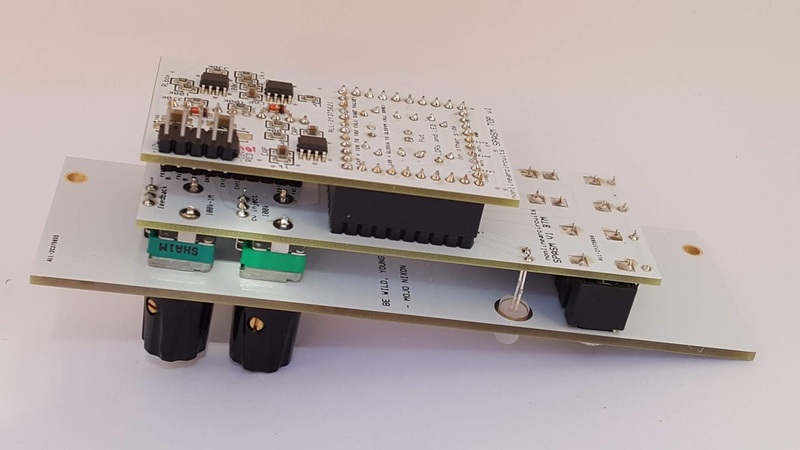 It is interesting to supply clock signals that are multiples or divisions of the audio signal, but like all NLC modules, feel free to do whatever you like. As mentioned, supplied with a gate and a CV it will perform as a complex pattern generator as well. I will get a demo up soon, but will promise this doesn't sound like a filter......it is very noisy and splatty. Are your beats tighter than a gnat's chuff? Whynot loosen off that ponytail and balter with a VC gate delay? 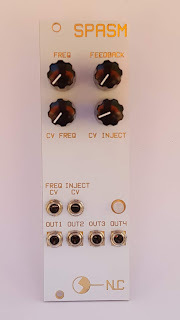 CV controlled delay ranges from 7 milli-seconds to 1 minute.